Like many, my fellow Whovians and I had been planning a get-together for months to celebrate and view Doctor Who’s 50th Anniversary episode The Day of the Doctor. We had a lovely Whovian Brunch and had an excellent time watching the 50th Anniversary episode. 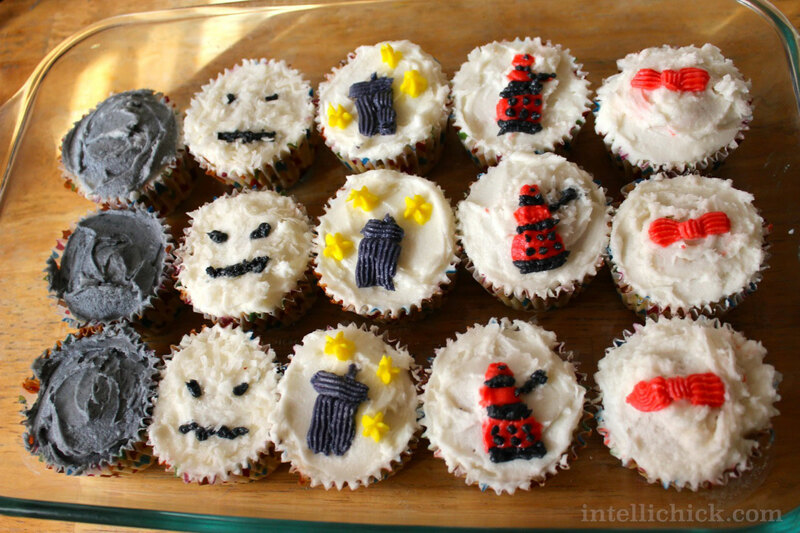 My contribution to our brunch was themed cupcakes – and true to Doctor Who form – it was a bit of a timey-wimey-wibbly-wobbly kitchen experiment. I had initially thought to make sugar cookies; it was the main reason I had purchased this Kuhn Rikon cookie and cupcake decorating set and Wilton gel icing color but the time I needed to prep for that just wasn’t feasible. I was also looking at steep learning curve given that I had never actually decorated baked goods to the extent I was envisioning in my mind. Perhaps I was emulating the Doctor…or just being myself! In the last minute I decided to switch gears over to cupcakes and try my luck. This turned out to require some extensive recipe searching since I only wanted to make 12 for sake of sanity. A number of recipes that made 24 weren’t easily halved and called for ingredients I didn’t exactly have on hand – at some point I was trying to divide 7/4 into two and then figure out how much corn starch I would need to replace and sift in the flour to make cake flour. It didn’t occur to me later that I could round up, but hindsight is 20/20, right? Anyway, by the time I was writing calculations in a notebook, I figured it was best to continue on with my recipe search. Did I mention I started this project at midnight? Eventually I found this excellent recipe of Perfect Vanilla Cupcakes from Dorothy at Crazy for Crust that would make 12-15 cupcakes. I didn’t have vanilla bean paste (though now I totally want to try some), but it was an easy substitute with regular vanilla extract. As those were baking, I went on search for a frosting recipe. I chose Wilton’s Buttercream Icing recipe. Since I wasn’t sure about what kind of consistency I would end up needing, so I ended up deciding I wasn’t going to worry about it. The soufflé isn’t the soufflé. The soufflé is the recipe. Perhaps the same can be said about cupcakes. Maybe. I had initially planned out a few ideas – the snowmen, the bow ties, and the Daleks. The TARDIS and the Weeping Angels – true to their nature – just sort of appeared. The Weeping Angel stone frosting was a fluke of aiming to make black icing. The TARDIS was a fluke of messing up with red and throwing in colors until I tried to save the frosting with a blue. And oddly, the bow ties – though cool – were more problematic than I had anticipated. Perhaps all this madness could have been alleviated by not having five different designs of multiple colors…but, well, it seems appropriate that there is a little madness when making cupcakes about a Mad Man with a Blue Box. Yay! Happy Doctor Who Day!